Scenery: Dutch clouds and trees conversing in intimate landscapes of their own. Mood of speech: the potential mood. Stage for this play: the spread, being both one and two. Mood: Potential is a short artist book that was printed by Brad Freeman with assistance of Daniel Mellis at the Center for Book & Paper Arts in Chicago. It was printed in duotone, referencing the two-part composites of each spread. 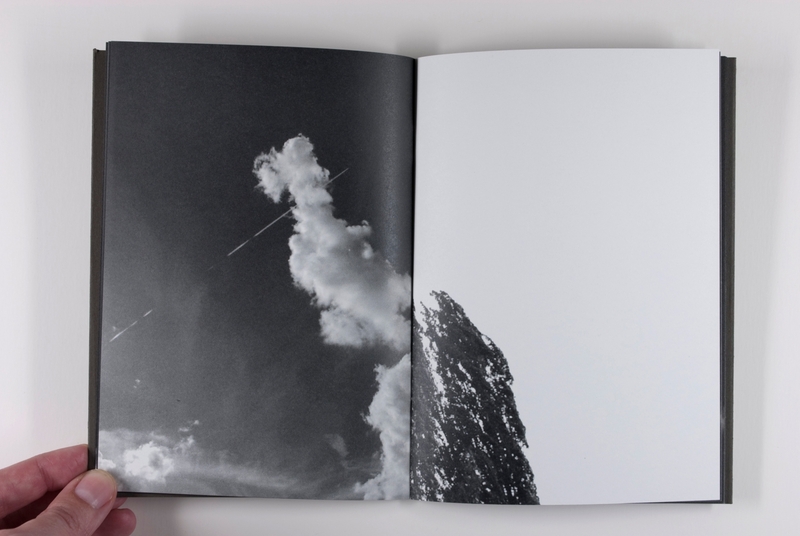 The book stages and un-stages potential landscapes of clouds and trees in a discontinuous, jittery movement. The book was included in the Journal of Artists’ Books number 27, guest edited by Tate Shaw. Chris Burnett wrote a thoughtful and enlightening essay about the book, also addressing its connections to photographic history. The essay, titled “Which cloud?”, can be read in the JAB27 issue. 5×7 inch, 32 pages, duotone offset on 80 lb. Dulcet, letterpress on cover and colophon. The book comes in an enclosure with the title printed in letterpress. The publication of Mood: Potential was made possible in part by a grant from the Netherlands Foundation for Visual Arts, Design and Architecture (Fonds BKVB). Elisabeth Tonnard presents a jumpy little book of clouds, like one of Gertrude Stein’s nervous literary objects, each cloud insecure in its association with frame, page, and the stuttering space around them. Contact to see if still available. The book is included in the collections of the Bayerische Staatsbibliothek, Bibliothèque Kandinsky (Centre Pompidou), Cleveland Institute of Art, Corcoran Library at the Corcoran Gallery of Art, Drake Memorial Library at The College at Brockport, International Center of Photography Library (New York), Kunstbibliothek (Berlin), Monash University Library, MoMA Library, National Library of The Netherlands (Koninklijke Bibliotheek), Sterling and Francine Clark Art Institute, The University of the Arts in Philadelphia, Zentralinstitut für Kunstgeschichte (Munich).